If you’ve suffered a personal injury in a workplace accident, you may be thinking about claiming accident at work compensation. The overall value of your claim could depend on four different types of expenses and losses, some of which may be more relevant to your claim than others. Personal injury solicitors can provide advice that relates to your specific circumstances, and this information should be considered as a guide only. General damages are the damages that the claimant is not billed for and cannot be accurately calculated by totaling up losses. In an accident at work compensation case or other personal injury claim, these might be the pain and suffering the claimant experienced as a result of their injury, the impact the accident had on their lifestyle, any psychological injuries they sustained, and whether or not the injury has made the claimant unable to continue participating in their favorite hobbies. Personal injury solicitors will work alongside you to help you determine exactly how much your general damages are worth. Special damages are easier to calculate than general damages. These relate to any quantifiable financial losses you sustained as a result of the accident and can frequently make up the bulk of accident at work compensation claims. Special damages may include lost wages, medical bills, travel expenses, prescription charges, household renovations and long-term care bills. You should keep hold of any documentation and receipts that relate to these expenses so you can prove that you endured these losses. Special damages are easier to quantify and claim compensation for than general damages, although you will need the help of personal injury solicitors to do so. 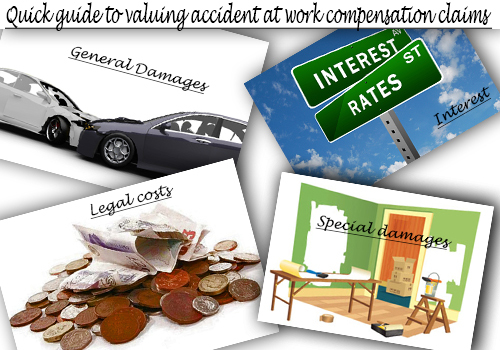 Legal costs are the costs involved in hiring solicitors and pursuing accident at work claims. Some personal injury claims are pursued on a no win no fee basis, and if you do not win you will not have to pay your legal costs, although you may still be liable for some expenses. If you win in your case, the losing party will have to cover all legal costs, and if you lose you may be liable for these expenses. It may be advisable to take out insurance to cover yourself in this situation. Your personal injury solicitors will be able to advise you on what your legal costs are likely to be and how you will be able to pay for them. If your workplace accident occurred a long time ago, then you may be able to claim interest in your personal injury claim. The interest can apply to both your general and special damages, with certain interest rules applying to each of these damages. Special damage interest accumulates from the date in which the losses were sustained, whereas general damages accumulate from the start of the court case. Your personal injury solicitors can help you calculate all these losses and expenses so you can determine exactly how much your accident at work compensation claim is worth.